This week, I'm going to walk you through a Core Set 2019 draft from first to last pick! I will talk you through my decision making - why I pick what I do, and what cards I think are good. 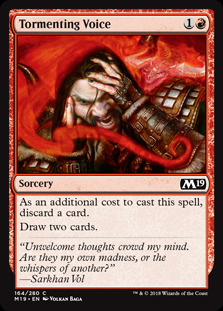 This is a good way to see the thought process of a draft. Let me know in the comments if you would have done anything different. Let's start with what I think are the best cards in this pack. 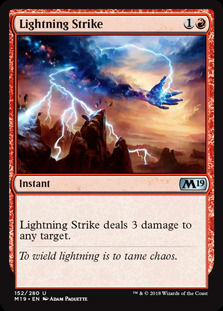 Shock is a nice cheap removal spell that is quite effective in this format, as there are a lot of 2 toughness creatures running around. 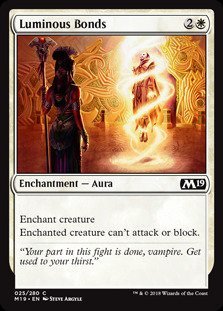 Epicure of Blood is one of the pay off cards for the white/black lifegain deck. Sleep is a very strong card in an aggressive deck, though not so good in a control deck. Finally, there is Chaos Wand . 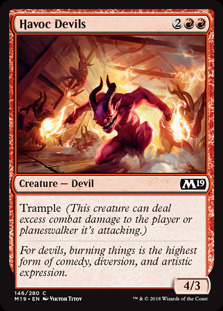 I'm not sure what to think of this card; it feels like it can be incredibly strong, but also high variance. I ruled out Sleep and Epicure of Blood as, despite their power, they are only good in specific decks. That left Shock and Chaos Wand. 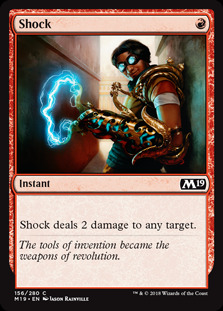 I really want to try Chaos Wand at some point, but Shock will go into any red deck and I know how good it is, so I took Shock. It's also the only red card in the pack, sending a signal to the next person. 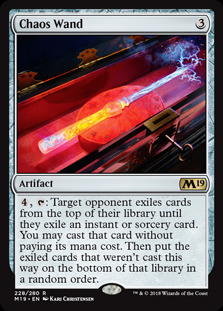 I believe this is the correct pick if you are looking to win; Chaos Wand would be the pick if you were looking to have fun. There are three cards I'd consider taking here. 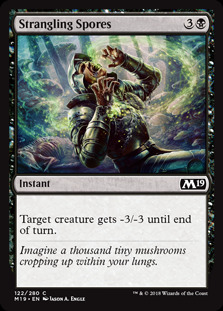 Strangling Spores hasn't been quite as good as I thought it would be initially, but is still a removal spell. Luminous Bonds is probably the best white common in the set and has been good for me so far. 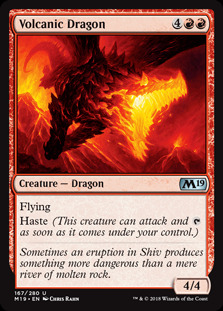 Finally, there is Volcanic Dragon which I think is a fantastic card and has so far won me quite a few games. It was easy to rule out Strangling Spores, and Luminous Bonds is better than it. That left me with that versus Volcanic Dragon. The Dragon has been incredible in every game I've had it so far, plus it went with my first pick, and thus it was my choice. This pack is pretty bad. We have Essence Scatter , which has overperformed for me so far. Manalith is okay if we are looking to splash or ramp. Totally Lost is a good tempo play, but it is expensive and only temporary. Daggerback Basilisk has been solid in green decks, especially with auras or combat tricks. 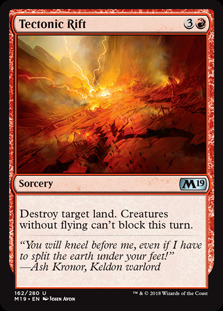 I ruled out Manalith early, as it is a cost to play this card and I'm not looking to necessarily splash. I've found Essence Scatter better than Totally Lost, so ruled out that. 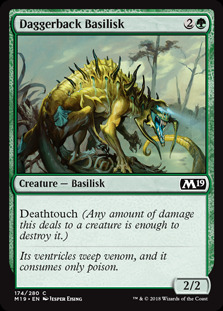 It came down to Daggerback Basilisk and Essence Scatter; I like Essence Scatter but decided to go with Daggerback Basilisk; both cards are similar in power and, in that case, I usually go for the creature. For this pick, I'm starting to look for what signals I am being sent. To do this, let's look at the best cards left in the pack, and there is one card that stands out way above the others. 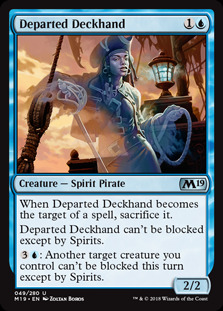 Departed Deckhand doesn't look like that much on the surface. A 2/2 for two mana that you sacrifice whenever it is targeted seems average at best. However, it is both good in the early game and the late. 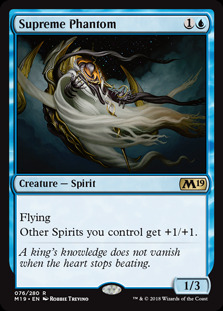 It's essentially unblockable as there are not that many other Spirits in the set, and later in the game makes your other creatures unblockable. This was an easy pick for me here. For this pack, I had an interesting decision to make. 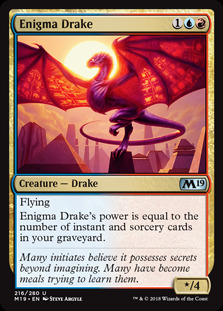 The two best cards in the pack are Sparktongue Dragon and Enigma Drake . The interesting decision was: do I take a safe pick in the Dragon, or a riskier pick in the Drake? Blue/red spells looks like it might be a good archetype, and I had already taken a blue card in the previous pick; so what should I do? My gut feeling at this point was that both red and blue were open. The Departed Deckhand in the last pack is a very good blue card, and the Sparktongue Dragon is a good red card. I decided to move in on this colour pair and took Enigma Drake . Having planted my flag, I'm now narrowing my vision on what cards I want: cards to support blue/red. So, instants and sorceries and things that care about them. Card draw is also useful. So, for me, it is a choice between Skyscanner , Boggart Brute and Mirror Image . 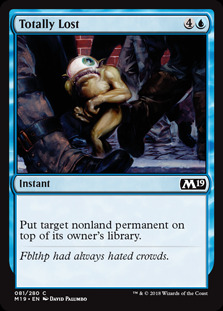 I'm actually not a big fan of this card in general. However, the two pay offs for this deck are Enigma Drake and Guttersnipe , and Mirror Image can become either one of these. Therefore, I think it's worth taking here. Boggart Brute would have been my next pick, as these types of decks often become aggressive tempo decks and that also fits what I want to do. There are four red cards here, but I only really want two of them: Onakke Ogre or Viashino Pyromancer . The Ogre wins out every day of the week against the Pyromancer. 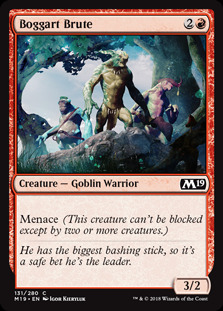 I have not been impressed with x/1s in this format at all, and while the Ogre dies to a 2/2, in the aggressive tempo deck I think this will turn out to be it will hit very hard. None of the cards in this pack are great for me. 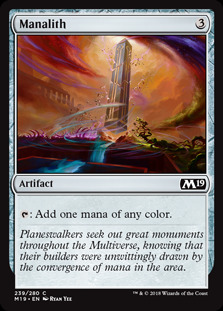 It came down to Smelt for the sideboard or Ghostform for what might end up being a marginal playable. I took Ghostform. 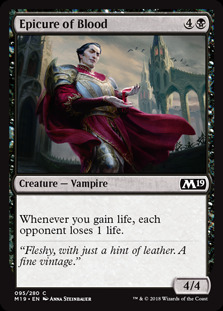 I'd normally suggest taking the sideboard card over a marginal playable, but I'm pretty confident I'll end up with a Smelt or two by the end of the draft. I'm back to the first pack I opened and I am quite happy to see both Disperse and Totally Lost come back, meaning that blue is certainly open. 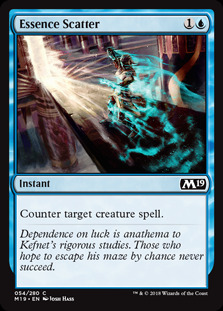 As I mentioned earlier, Totally Lost is a good tempo play, but so is Disperse, which is also a full 3 mana cheaper. I'm all about cheap spells for this deck, so Disperse was the pick. Guttersnipe is the pay off for this deck along with Enigma Drake , and I'll take as many as I can get. Three more cards that would slot into my deck. Crash Through might be an odd choice, as Totally Lost is the tempo play and allows my creatures to get through. 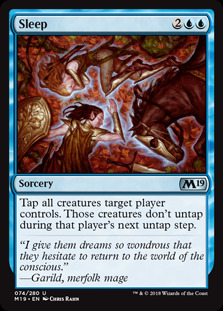 But Crash Through has two upsides: it costs one mana, and draws a card. With luck, this will let me cast two spells in the same turn, hopefully triggering Guttersnipe and buffing Enigma Drake . 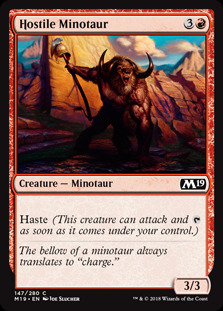 Hostile Minotaur may or may not make the cut, but it is an okay card in an aggressive deck. 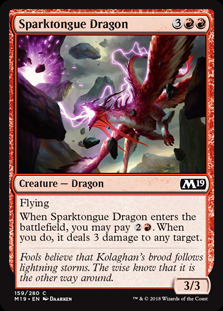 How the heck did Sparktongue Dragon get all the way to pick 13? 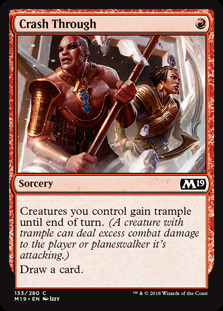 Either no one is in red, or people are undervaluing this card. Whatever, I'll take it. Well... this isn't a good pack for me. 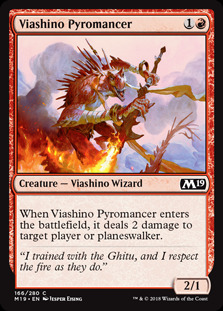 We have Viashino Pyromancer , which I've already spoken about. 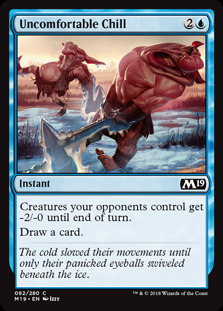 Uncomfortable Chill is a better defensive card than aggressive, but it does draw a card. Tectonic Rift is pretty poor, and while Rogue's Gloves is alright, it doesn't fit the instant or sorcery theme. 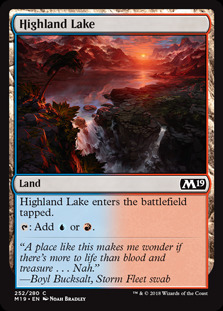 Then there is also Highland Lake . I took Uncomfortable Chill, but am not thrilled about it. I'm not happy with the first two picks of pack two; the red and blue has been very lacking. Onakke Ogre is the only card that comes close to me, so it was the pick. Ok, this is a better pack. 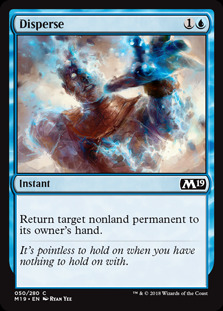 Dwindle is an alright "removal" spell, but it doesn't really fit with what I am doing. 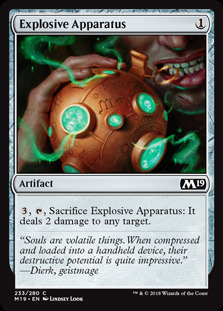 Tormenting Voice lets me dig for more spells and is a sorcery, while Electrify is solid removal and is an instant. 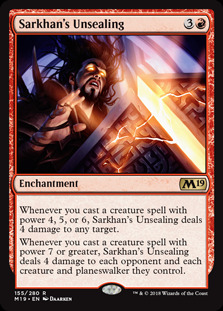 There is another Uncomfortable Chill , and there is also Sarkhan's Unsealing . 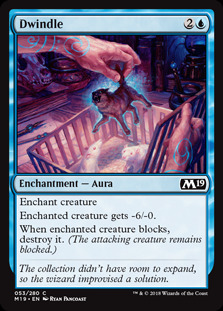 This card is very, very good. 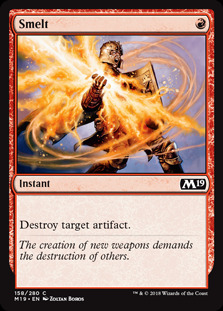 So despite me saying that Sarkhan's Unsealing is very good, it doesn't fit my deck very well. I had picked up three 4-power creatures already though, so I did consider it. In the end, though, I'd rather be curving out and casting removal spells. This line of thinking led me to take Electrify over it and Tormenting Voice . This pack has Sure Strike , another instant that fits with the theme of curving out and attacking. There is another Ghostform as well. We have Aviation Pioneer , a pretty decent blue creature. 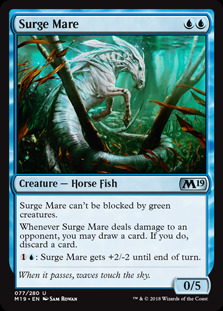 There is also Surge Mare , which is a better creature, though does cost double blue. I'm actually not sure this was the right pick. But my thinking went like this. I didn't want Ghostform; I already had one that I wasn't sure I would play anyway. Sure Strike is a combat trick, albeit a decent one, but I felt I could get it later. That left Surge Mare or Aviation Pioneer. 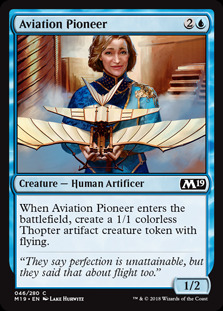 The reason Pioneer won out was because I wasn't heavily into blue (in other words, I had more red cards), so the double blue casting cost was prohibitive. In the end, though, it doesn't have any synergy with my deck, and I think Sure Strike might have been the better pick. This pack is full of goodies for me. 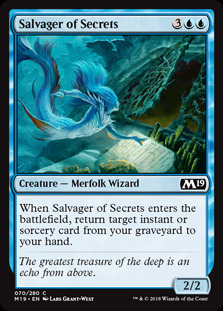 We have Salvager of Secrets , which is very good when you have decent spells to get back from your graveyard, as well as Boggart Brute and Onakke Ogre , to aggressive creatures that would fit in nicely. Considering I had a couple of removal spells already, Salvager of Secrets seemed like a no-brainer. Electrify on turn 4 into Salvager turn 5 seems pretty good! Onakke Ogre was the only card I was interested in. Despite there being some red and blue cards here, none of them really fit the plan of my deck. I picked Explosive Apparatus , just in case I ended up low on removal. There was no way I was going to pass up another Guttersnipe , so this was an easy pick. The Sure Strike that I thought might have been the correct pick earlier came back, so I'm pretty happy now. This pack has a few cards that would be useful to me. 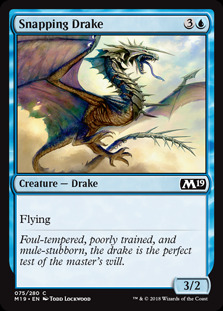 Snapping Drake is a good evasive threat that would be at home in the deck. Sleep , like I said in the first pick, is a powerful card for aggressive strategies - which is where I have ended up. Then there is also another Guttersnipe , which is a no-brainer. I actually took Sleep over the third Guttersnipe, despite Guttersnipe being a good pay off. With the creatures I had taken so far, Sleep will probably win the game for me if I cast it, so I took it. 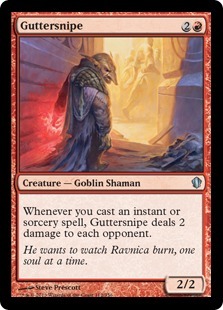 I also think it's possible Guttersnipe might come back - I'm not confident, but no other deck wants it, so there is a chance. Here, we have another Onakke Ogre , another Scholar of Secrets , and Lightning Strike , an excellent removal spell. Lightning Strike was a pretty easy pick. 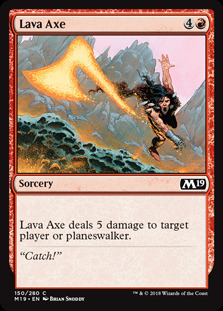 It becomes an instant speed Lava Axe with a Guttersnipe out, but more importantly, it removes blockers to allow my creatures to get through. 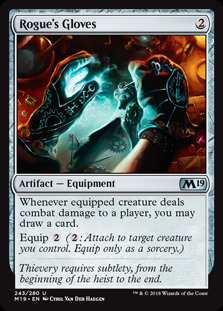 There were three cards in this pack I was interested in, all of which I already had one of: Electrify , Salvager of Secrets and Volcanic Dragon . I was pretty tempted by the Volcanic Dragon here. The issue was I already had a five and six drop and, ideally, I wouldn't want the game going that long. 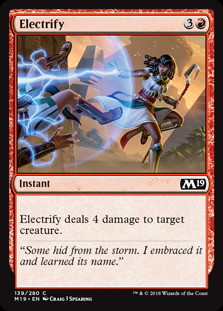 I took Electrify as another good removal spell. Essence Scatter was the only card I was remotely interested in in this pack. I normally don't like playing counter spells in limited, but this is an exception; I never want more than one, and it also works well with my pay offs. This pick was out of Snapping Drake or Disperse . The only question was: creature or tempo? I was actually slightly light on creatures I wanted to play at this stage, so I went with Snapping Drake. But I don't think either choice would have been wrong. Havoc Devils or Supreme Phantom ? The Phantom is a bit more defensive than what I wanted out of this deck, so Havoc Devils was the pick. 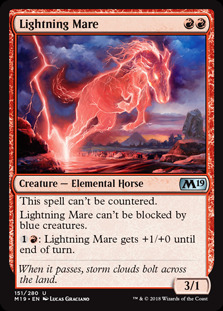 I picked Lightning Mare more for the sideboard than the main deck. 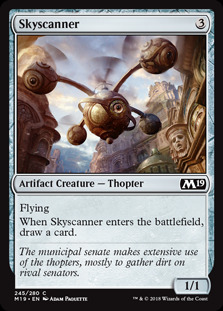 I don't think this is a great card, to be honest, but it could be good against heavy blue decks. 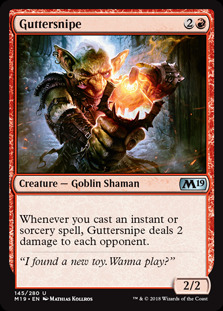 My hunch about Guttersnipe coming back was right - yay! That now makes three of them plus an Enigma Drake (and a Mirror Image ), so I'm pretty happy. I was pretty happy with this. 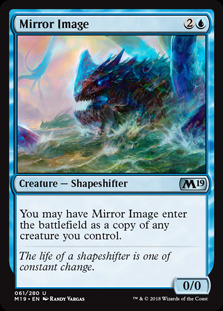 Three Guttersnipe , one Enigma Drake and a Mirror Image to copy them is a lot of pay off cards for having instants and sorceries. Thankfully, I have a lot of them as well. 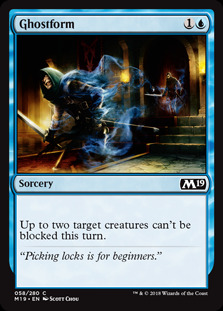 My plan with the deck was to be aggressive, using removal to allow my creatures to get through on the ground, and hopefully getting some Guttersnipe triggers in as well. The plan (and the deck) worked perfectly, taking me to a 3-0 record without dropping a single game. At one point, I had all three Guttersnipes in play and cast Lightning Strike on my opponent's only creature; I took them from 12 to 0 in that one turn. I also won one game where I didn't draw Guttersnipe or Enigma Drake; I just attacked on the ground with the Onakke Ogre s and Havoc Devils , using removal to get rid of any creatures. This got my opponent dead extremely quickly. I've always been a fan of this archetype, and it felt great here. Hopefully I can draft this style of deck over and over again! Very nice! After reviewing the picks a couple of times, there is only one question that I had. Did you consider Skyrider Patrol at P2P1? I know he is not as good as a splash, but still a strong card. Your deck as is was very streamlined and obviously worked well for you, but I'd like to see what you thought here. I generally consider picks 4-6 to be the key picks, maybe even more important than the first 3 picks, because this is usually where I get a sense of what is open and what may not be. I didn't, and I can tell you why - I missed it. It's one of my flaws; once I know what I'm trying to do I kind of get tunnel vision. I noted that BenS on CF did some P1P1 examples. He also had the choice between Shock and Reclamation Sage as in your P1. He ended up taking the Reclamation Sage. It seems like a card you did not really consider as a first pick? Correct. I've been asked that on other platforms today as well. I have been finding that Reclamation Sage wheels for me. I'm also not totally on board with it being main deckable at this point. In fact, in the pick you are referring to, I would have taken Shock, Runic Armasaur and Aven Wind Mage over the Reclamation Sage. I guess that I would have done the same as you. Maybe Runic as a first pick but I have not yet had a chance to try it out. It's mostly about it's stats rather than it's ability. The 2/5 blocks, kills and survives against all the x/2s such as Boggart Brute, Onakke Ogre and Rhox Oracle.